A beautiful and cosy house is waiting for you today. 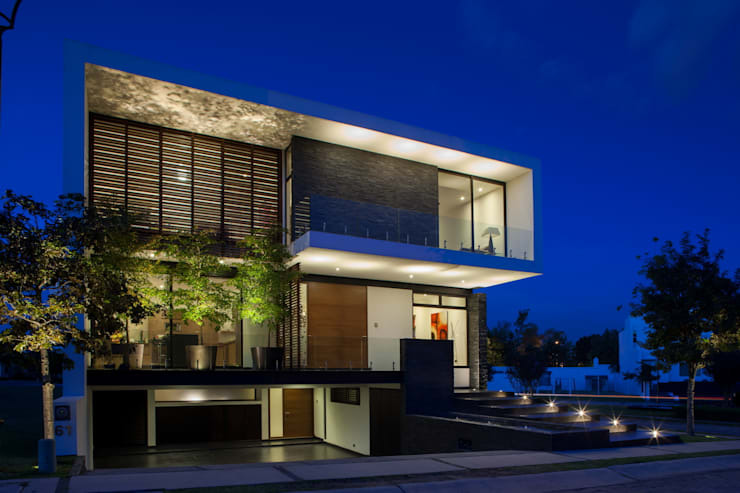 Rendered by the architects at GLR Arquitectos, this residence makes use of natural materials to create a lasting impression. 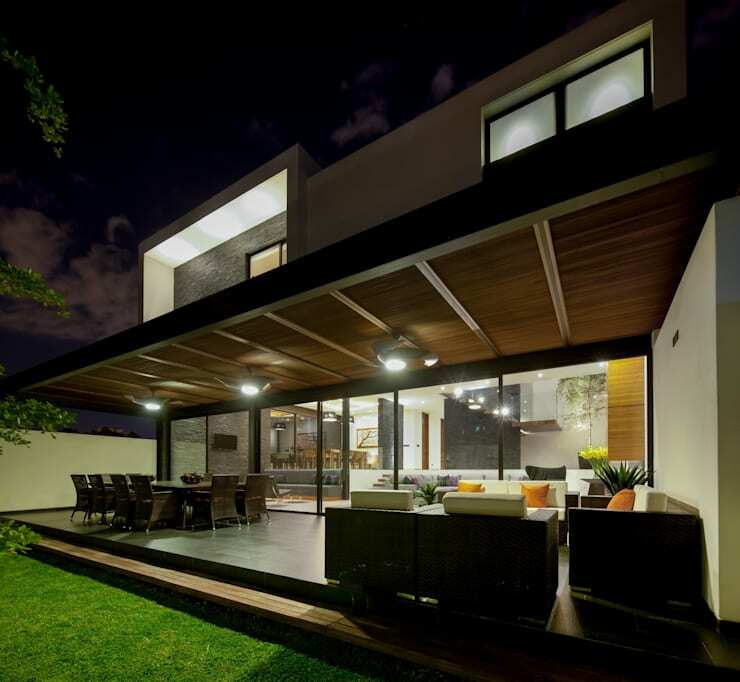 Built with locally sourced materials, it gets ample sunlight during daytime and is stylishly illuminated after dark. The interiors are spacious, neatly designed and feature trendy furniture for comfy living. Lavish use of glass for an open feel is the reason behind this. Wooden elements appear here and there for warmth as well. With neatly tiered stairs leading to the entrance and smart use of stone and wood, this modern house looks remarkable on the outside. 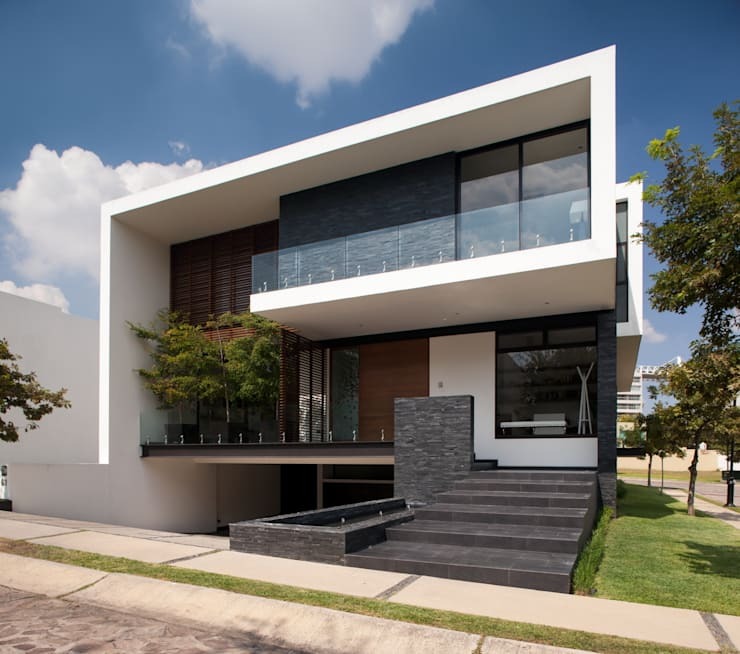 The use of wood on the second and third levels adds warmth and personality, while the white and dark grey colour palette is extremely classy. Tall potted greens on the second level terrace add life to the facade. 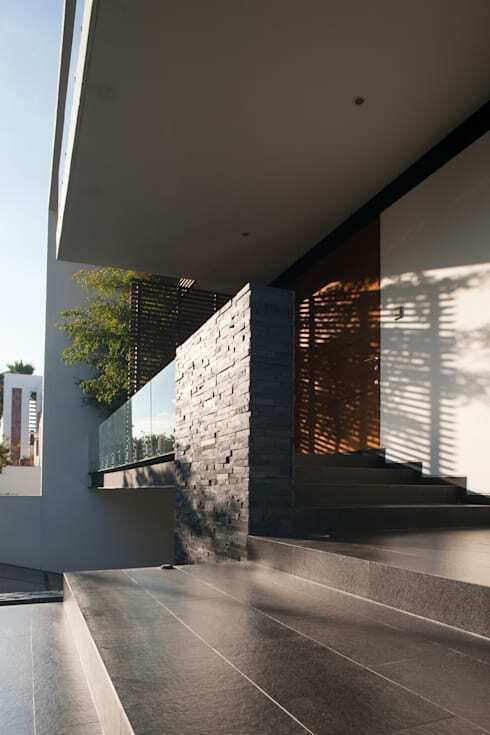 The combination of wood, the shadow of the slats, grey stones and clear glass make the entrance one of a kind. It has an air of mystery about it. 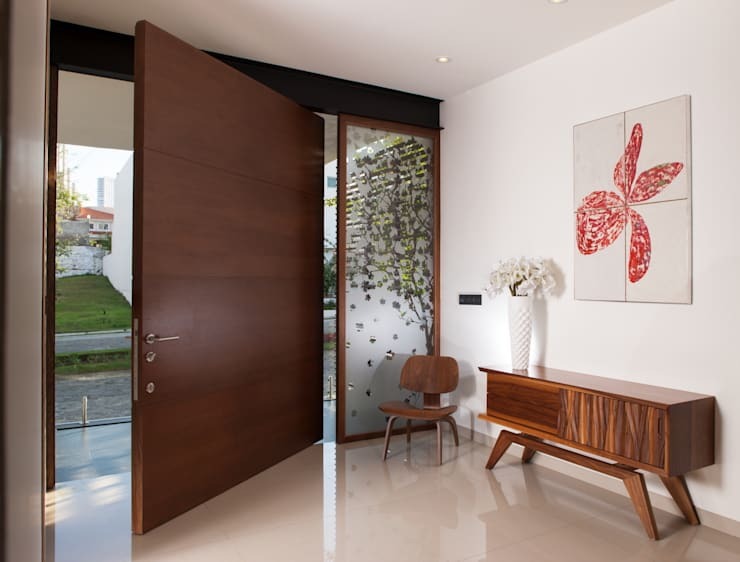 A massive wooden door flanked by stained glass panels, trendy wooden furniture, a charming vase and a very stylish painting make the entrance inviting and pleasing. The glossy and white porcelain floor is very luxurious. The beautiful living room is a blend of the grey sofa, the black and purple cushions, the black rug and chair and the wooden elements. All designs are sleek and contemporary and there is ample lighting. The contrasting colours of this space are further enhanced by textures like wood and stone. The staircase connecting the different levels of this house lurks in the background and wraps around a grey stone wall. Thanks to an open plan layout, the living space opens up stylishly to the dining area which overlooks the garden through lavish glazing. Hence, the sunlight gets to travel everywhere unhindered for a cheerful and bright ambiance. The glass balustrades of the staircase in the living space ensure that every nook and cranny is illuminated. Kitchen that will wow you! 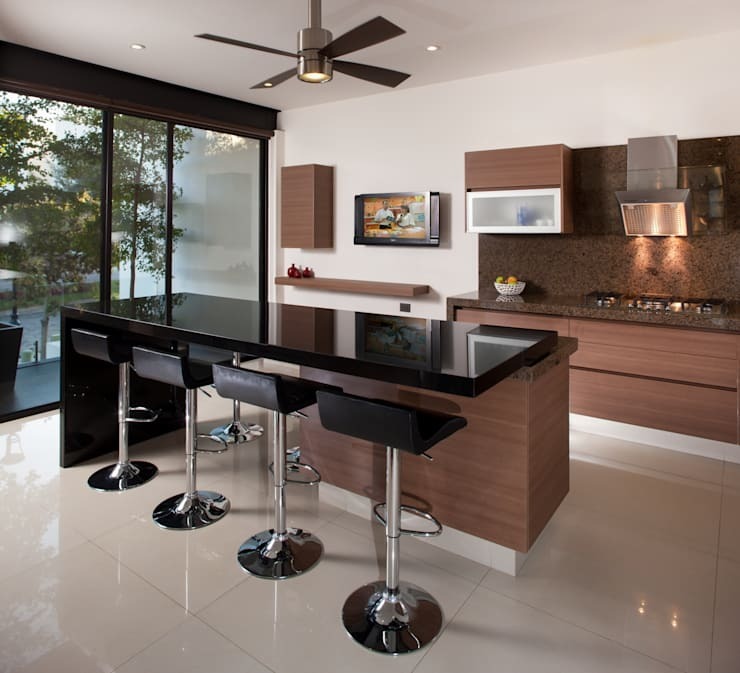 Smooth wooden cabinets and glossy porcelain floor make this trendy kitchen a very attractive space. Sliding glass doors bring in oodles of sunlight and a stunning view. The kitchen island boasts of a bold black top and stylish chairs to enjoy drinks, grab a quick bite or chat with the chef. 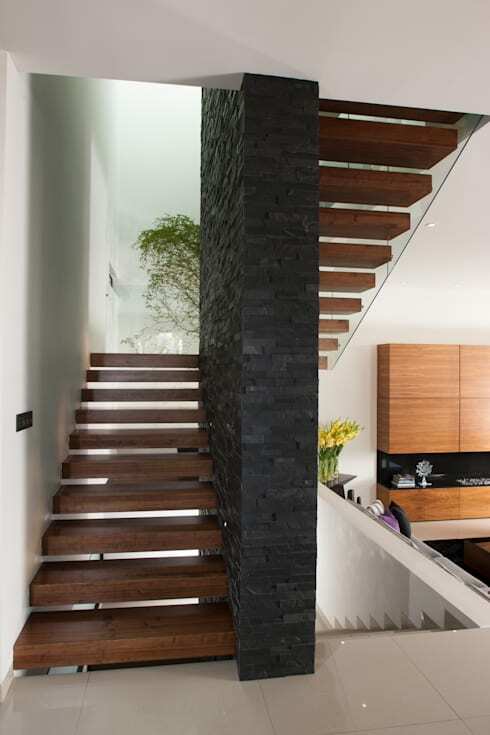 Wooden planks set on both sides of the grey stone-clad wall make going up and down a fashionable affair. The structure is very elegant and the glass balustrades enhance its beauty. Equipped with trendy lights, the terrace is ideal for relaxing, sunbathing, chatting with loved ones or relishing tasty meals in open air. The entire wall on this side of the house is composed of clear glass, that connects the outdoors with the indoors at all times. Light travels everywhere freely, making the terrace an inviting and impressive space. After sunset, the cleverly positioned interior and exterior lights are switched on for a magical look. Lights illuminate the steps leading to the entrance as well, while the indoor lights shine through the glass to bring the whole house alive.